On 14 January 1836, Ignace-Henri-Jean-Théodore Fantin-Latour was born in Grenoble. He was the son of a French portrait painter, Jean-Théodore Fantin-Latour and a Russian mother, Hélène de Naidenoff. To distinguish his work from that of his father, Fantin-Latour signed his pieces with "Fantin," since Latour was added to the family name only in the seventeenth century. Fantin received his first drawing lessons from his father. In 1841, the family moved to Paris, where Fantin-Latour was admitted to the Petite Ecole de Dessin in 1850. For several years, he also took classes with Horace Lecoq de Boisbaudran, who had developed a special training method. His pupils were expected to train their visual memory by making a mental image of a subject and subsequently painting it from memory. Beyond that, Lecoq emphasized the independence and individuality of the developing young artist. In 1854, Fantin Latour was admitted to the Ecole des Beaux-Arts. After only three months, he was expelled for making too little progress. Fantin was undeterred and until the 1860s he mainly taught himself by visiting the Louvre and copying works by the old masters he admired. His favourite artists were Titian, Frans Hals, Rembrandt, Van Dyck and especially Veronese. Around this time, the Louvre was a key social gathering place and here Fantin met several fellow painters with whom he became friends, including Edouard Manet, James McNeil Whistler, and Frederic Leighton, who would become director of the Royal Academy in London. Both Whistler and Leighton introduced Fantin to English collectors who would take a special interest in his flower still lifes. He managed to establish himself as a respected flower painter in England, while his still lifes were largely neglected in France. Fantin is primarily categorized under Realism, the French art movement from the middle of the nineteenth century with Gustave Courbet as its father. It is mainly due to his association with the progressive group of artists, poets, writers, musicians and critics from the period he portrayed that he was regarded as a progressive. The reputation of his subjects, including Manet, Renoir, Astruc, Zola, Maitre, Bazille, and Monet remained controversial, to say the least. In contrast to his non-traditional subject matter, Fantin's style is almost academic, partly inspired by seventeenth-century Dutch painting; he is not known for innovation. Unsociable by nature, painting portraits was not his favourite activity and he preferred to paint his pieces withdrawn in his studio. He also despised painting outdoors and though he was an exact contemporary of the impressionists, he avoided landscapes. When he discovered the flower still life in the 1860’s, this would determine the bulk of his creative production and income for nearly thirty years. While his flower sill lifes were profitable, his passion was fantastical, dreamy scenes, inhabited by fairies and nymphs, for which their was no market. For these imagined pieces he was inspired by the music of composers like Wagner, Berlioz, Brahms and Schumann. A little known aspect of Fantin’s oeuvre is that he discovered lithography as the perfect medium for these works and was one of the first artists to put it to use as an independent art form. Victoria Fantin-Latour, Catalogue de l'oeuvre complet de Fantin-Latour, Parijs 1911; Exh.cat. Den Haag, Kunstzaal Kleykamp, Fransche schilders der negentiende eeuw, 1927; Exh.cat. Enschede, Rijksmuseum Twenthe, Kersttentoonstelling, 1946; Exh.cat. Enschede, Rijksmuseum Twenthe, Kersttentoonstelling. Schilderijen van J.B. Scholten te Enschede, 1964; P.L. Mathieu, The Symbolist Generation 1870-1910, Genève/New York 1990, pp. 57-59; J.F. Heijbroek en E.L.Wouthuysen, Portret van een kunsthandel. De firma Van Wisselingh en zijn compagnons 1838-heden, Zwolle 1999, p. 60; H. Balk, De Kunstpaus H.P. 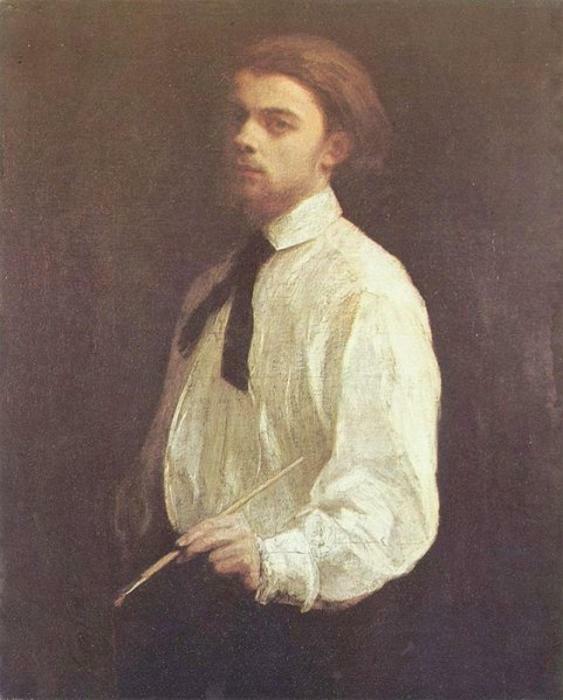 Bremmer 1871-1956, Bussum 2006, p. 102; V. Bougault, 'Henri Fantin-Latour entre ombre et lumière', Connaissance des Arts, 651 (2007), pp. 86-91; S. Guégan, 'Henri Fantin-Latour, un atelier aux Batignolles', Beaux Arts magazine, 277 (2007) pp. 104-107. Kersttentoonstelling. Schilderijen van J.B. Scholten te Enschede, Enschede, Rijksmuseum Twenthe, 1964. Work by Henri Fantin-Latour is represented in the collections of diverse museums, including the Rijksmuseum Amsterdam, Dordrechts Museum in Dordrecht, the Kröller-Müller Museum Otterlo, the Metropolitan Museum of Art New York, the Louvre and Musée d'Orsay Paris, the National Gallery in London, the National Gallery of Canada, Ottawa, the Museum of Fine Arts in Boston and many more.